Fire Safety Certificate Training on Request in your Area. Fire Safety Certificate Training Courses and Certification in Cork, Kerry, Limerick, Clare and Tipperary in Ireland. 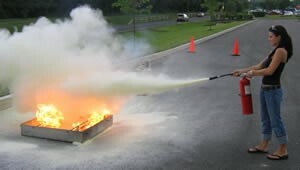 We offer a Fire extinguisher training course that will immediately improve the quality of Fire Safety Certificate in your workplace by providing your employees with the knowledge and training to correctly select and safely use a fire extinguisher, fire blanket and fire hose reel.